Am I the only one losing my temper more often as a result of all this training? Is it just me losing my patience or are the training (or the supplements??) increasing my testosterone levels? My knuckles had just managed to heal before I punched an air pump in a petrol station yesterday for deflating rather than inflating my tires (and for charging me 1€ for the service). (It was a "digital" pump - for God's sake, why does everything have to be digital these days?). Now I have to wear the badge of grazed knuckles for several weeks at work and I am unable to make up a story (and, if I were to do so, people would probably assume that I had been in a fight) so I just sheepishly tell the truth to anyone that asks. I have to allow for some margin, especially on the long bike rides. I actually like cycling but the flat tires, the loose bolts, the grease, the stretching gear cables just MAKE ME MAD! I've got a number of long rides still ahead of me - not to mention the races themselves - so let's see if I can "mentalize" myself beforehand so that any little mishap doesn't send me into a freaking frenzy. It is difficult not to get upset. You go to extreme lengths to be able to shoehorn in a 6 hour ride at the weekend, trying to disrupt things as little as possible, you know that it is probably THE most important training session of the week and you also know that, if you don't do it right now, you won't get another chance. So when something threatens the sacred training session, all the energy you put into making space for it in the first place, not to mention some of the energy you have psyched yourself up to expend in the session itself, comes tumbling out in the form of unadulterated rage and frustration. Once I was on my way, it was fine and I even enjoyed a large part of the ride, in spite of being on my own the whole time. I found myself thinking wayward thoughts while I was on the road bike. I started to fantasize about my other two-wheeled love, the mountain bike. When my training volume was lower I favoured the road bike for its silent speed and elegance but now that it is not about speed but about how many beats my heart makes, I find myself lusting after the robustness of the mountain bike. I must have a fairly short memory after what happened a few weeks ago. Anyway, these are dangerous thoughts to have - it occurred to me that I would be quite capable of kicking in one of the wheels if I really lost it and that would be very expensive (and embarrassing) indeed. 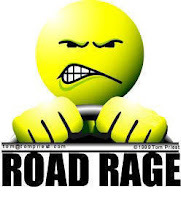 Anyone else been suffering from road (bike) rage? I'll feel better if you tell me that there is. I'm hoping that I will be able to calm down a bit after all this. Well Rob, i think that when training load increases recovery becomes more difficult and all body suffers, even our energy,our mind,our smile. I think it's completely normal. Bike mechanics ofente desperates us, this week three flat tires, a broken chain in villa madrid duathlon. Everything make us stronger at the end. oh no, what a disaster... i'm sorry about your duathlon but at least it was in madrid and not something you travelled far to go to. still, must have been a bummer.